As you know, my mantra is “think b4 breeding”, hence the name of the blog as well as being my name Bee. A lot of the magic of breeding and the challenges is to turn your thoughtfulness into a product that becomes what you wanted – or in some cases, not what you expected but a good result. For example, you may have bred for early speed, got a foal that turned into a “work in progress” but later went on to become a really good and fast aged horse. That’s not what you expected, but the underlying factors came through in the end. So we are always trying to work with mother nature and our own knowledge and intuition, but there are no guarantees. 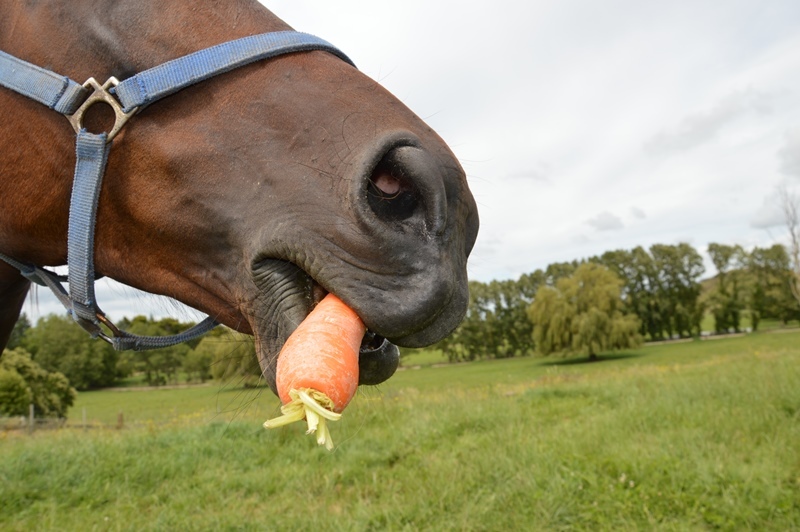 Not even following a recipe is a sure signpost to success, because with horses both genetic and environmental factors create so many variables. More so than baking a cake. But I do think the analogy is useful because with cooking and with breeding, it is really hard to know from the outside what are important factors. Who would have said tiny quantities of salt and baking powder or chilli and garlic, for example, would transform a dish? And yet we know they can and do. I’m right at the point (again) where a concept becomes reality – a breeding match on Tesio or wherever becomes a real living (if all goes well) foal on the ground. And after that, there is such a long, long road to negotiate successfully. But at least, there is a start and a reality rather than just a dream. For me, today, it was a visit to Alabar NZ at Waiau Pa near Auckland, New Zealand. This is the result of my breeding The Blue Lotus (Grinfromeartoear x Zenterfold) to Shadow Play, the second time I have gone for this particular match. The first is now a 2yo renamed as Blackened who last I heard was having time out after a very positive start in education. The new owner in Australia loves him, and his trainer is positive so far and is paying up for the 2yo races on what they see. That’s one reason I was pleased to find today a very similar type of foal – sharp, energetic, streamlined. She reminds me a lot of the colt, who just loved to move and play and run. What will this filly turn into, well, who knows. It could be – like her Shadow Play relative over in America right now, Lady Shadow – a fantastic strong stayer. Judging by those long, long legs, she may take time to grow into her full size! But I won’t be setting any goals for her just yet. I’m so pleased to see her on the ground, looking lovely and long legged, and my mare all glowing with pride. Step One is healthy foal on the ground, and a mare that is doing a fantastic job as mum. Thanks to Alabar NZ, always a great team to deal with. Tough, tough, tough. Character and toughness are the best outcomes for Grinfromeartoear progeny. It doesn’t always happen. But he has super genetics as a sire, and if he gets the right match and strikes it well, you get exactly that – tough and good. Massachussets is one place I haven’t seen, unlike the Bee Gees song of the same name. But I have watched videos of a good few races from Plainridge Racecourse in the state. For those of us who, like me, have to Google to find where some of these racecourses are located (and to be honest, where some of the states are) basically Plainridge is up and off to the right from New York city, on the eastern seaboard, and part of a group of states known as New England. So yes, that’s on my list of places to visit one day. Geegees and haunting lyrics from the Bee Gees. These days my point of interest is one special horse I knew as “Duncan”, a Grinfromeartoear gelding from my good mare Zenterfold and so a full brother to The Blue Lotus. I’ve blogged about him before because I’m really proud of his exploits in North America – low key but really consistent and paying his way with some stout performances. Like most Grins, getting better with age, character. In his latest race he was a very close second, but took a time of 1.51.3, which I believe is the fastest he has ever gone. His winning record is 1.52. So I am rapt to watch him doing a good job without a lot of pressure. In the same race new comer Jay Bees Grin N another import from NZ and another Grin horse, still has to learn how competitive it is up there, and wisely didn’t press from the widest draw. But will find his mark up there well I reckon. So although the time is not a shattering one, it is good and solid and what I bred the horse to do, and also good to see him performing and looking well for a stable that has picked him up and put some thought into him. Latest stats: US$37,000 this season so far and his total in America is $106,815 and with his NZ earnings added (in US$) $136,342. I’m proud of him. 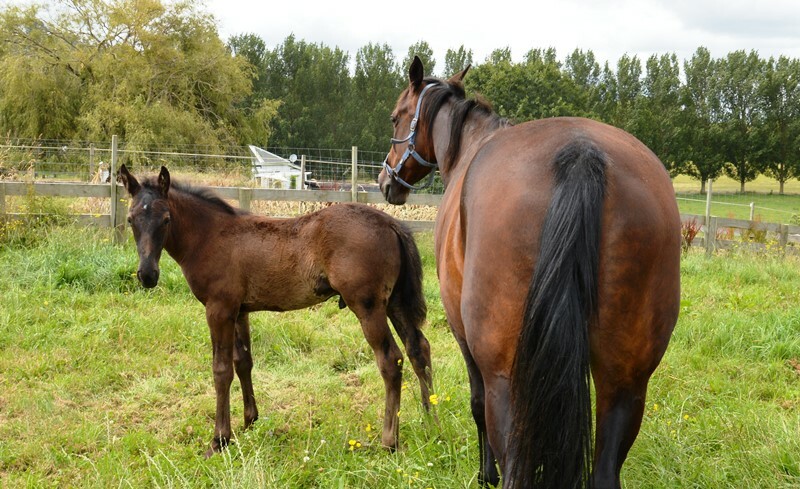 In my next blog I will introduce his latest half-brother, his sister’s foal (just born) and her next potential foal – which may be a little outside the square but very exciting. To be honest, I carry no expectations re the results, but this is a lovely story of 3 generations of the immediate family getting into the Silvers and Finals of 3yo filly Sires Stakes racing. For those of us who have a passion for breeding, I just want to share this because I am super proud. Zenterfold won the the Sires Stakes Fillies Silver 2003, for trainer Geoff Small and driver David Butcher. Her daughter The Blue Lotus got third in the Sires Stakes Fillies 3yo Final in 2010, albeit 8 lengths behind the wonderful quinella of Carabella and Bettor Cover Lover. With a good trip and tenacity, she held a clear third in front of others. David Butcher again the driver. So it is stunning that the third generation Amazon Lily (Bettor’s Delight x The Blue Lotus), is in the same race final, this year. I am sure co-breeders Ken and Karen Breckon and Dom Zame will also be watching. Whatever the results, I will be happy. Making finals at the high end of the game is an achievement. Tip o’ the hat to trainer Ken Barron, co-trainer and driver Blair Orange, and those who are looking after her up north. Introducing my yearlings grown up and almost ready to go. This time of the year is the “sneaky peek at the presents”. In this case not Christmas presents but the yearlings that will be up for sale in February 2016 – and it is a very interesting catalogue, thank heavens, after a drought for a couple of years. Introducing you to my two yearlings, whom I have blogged about before as they developed. 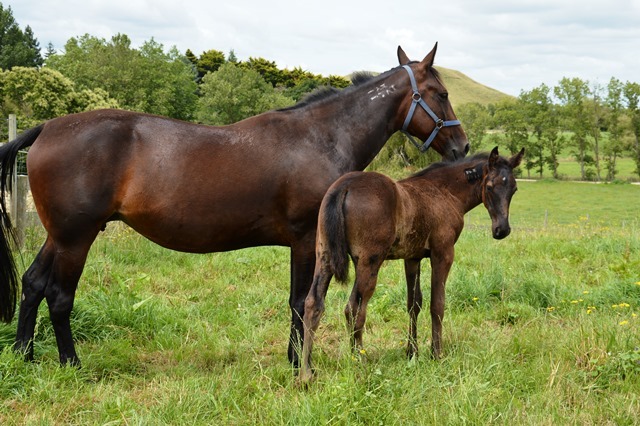 It seems such a long time since I saw “Leo” (Shadow Play x The Blue Lotus) and Taffey (Rock N Roll Heaven x Zenterfold) as shy foals alongside their much loved mums. Here they are now with only weeks to go before the yearling sale in February at Karaka. They are teenagers with personality and bodies that are well enough developed to show off type and character. Luckily I have two lovely ones to put up and heartfelt thanks to the mares Zenterfold and her daughter The Blue Lotus. The Shadow Play colt is well grown, athletic and has personality plus, a guy with a sense of play but wanting to have something to do. He will come up as a 2yo but if someone has the patience, he will be so much better as a 3yo. I love this colt. He is so interested in life, loves being around people and even not fazed by standing right outside our house rather than in a paddock. He is curious, learns fast, he thinks. Here are two more personal photos for my blog followers about The Snow Leopard (Shadow Play x The Blue Lotus). Similar for my filly from Zenterfold, will follow. Leo aka The Snow Leopard, getting to know where we live. 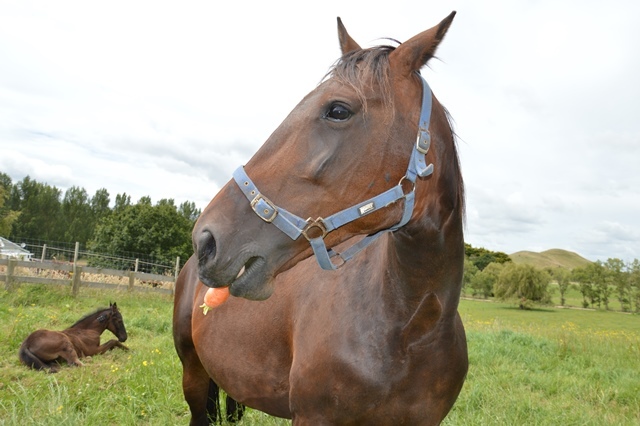 The Blue Lotus enjoys a carrot while her foal enjoys a rest. Lovely to have The Blue Lotus back home with her Shadow Play colt foal at foot. She’s back in foal to A Rocknroll Dance. May your 2015 year be as sweet as a carrot!